Yeah, next time your at the home improvement center, or auto parts store; notice how many guys have bandages. (2) GF: it says "Self Help", not "DIY" (just funnin'). 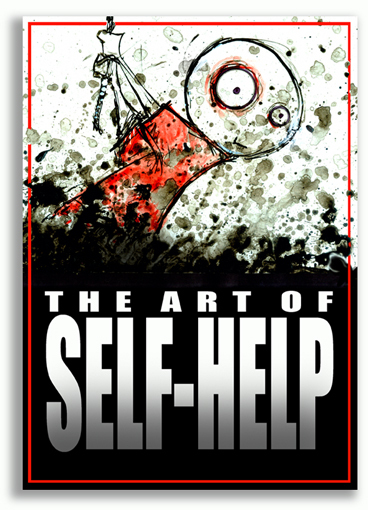 (3) Most people view "self help" as "how to change the behavior of everyone else." Progressive:(n) A myopic cyclops with an eye in the back of its head. John - the cover looks like my son hitting it out of a sandtrap when he was in elementary school. Terwiliger - love your comments. For what it's worth - many times when I have worked on a DIY project, I have found myself needing a self help book - it's much cheaper than a padded cell. I must say that I enjoy reading 95% + of what's written here--a small handful of regular & semi-regular posters, & both fun & pointed content that isn't overrun by a cacophony of idjits. Thanks to John & all posters (apammers excepted)... even Minimus. Outstanding! Ahmadinejad did us a big favor! Each of us frantically delude our self into considering he (and others who applaud him) are fit to get treated as reasonable people, he spits in our face to remind us that individuals are (once again) fooling our own selves. It was something of great excitement discovering your site this morning. I got here now hoping to learn new things. I was not let down. Your ideas on new tactics on this subject matter were insightful and a wonderful help to us. Thank you for leaving out time to write down these things as well as sharing your thoughts. I like this information shown and it has given me some sort of inspiration to have success for some reason, so thanks. Westward Parts is Canada's leading wholesale distributor of "all makes" agricultural equipments and small sprayer, grounds maintenance and recreational equipment. Thanks for all the information. On a facet note, how do you cope with all the spam you get in your weblog? My new weblog is getting destroyed by random spammers and I've been spending plenty of time and energy deleting feedback its merely not funny. . I get so drained fighting spam that I feed I ought to stop operating a weblog entirely. When one sights the issue available, i've to go along your determinations. You understandably show cognition relating to this subject and i've much to discover out after reading your post.Much salutations and i will be for just about any further revisions. At one time whenever weblog reading was a big interest of mine, but I simply got bored after doing it just for long. Presently, I just tend to look at the pictures and also the head lines in addition the subheadings, but stumbling right here makes me read this post, and I was grateful, seems like thanks to you, my weblog reading interest has came back. I used to be recommended this blog by my cousin. I'm now not certain whether this post is written via him as no one else understand such detailed approximately my difficulty. You are incredible! Thanks! Admiring the time and energy you put into your site and in depth information you offer. It's awesome to come across a blog every once in a while that isn't the same out of date rehashed information. Fantastic read! I've saved your site and I'm adding your RSS feeds to my Google account. This is actually very worthwhile, thanks for spreading it. Remember to also go to our internet site. We are a property improvement provider that offers finished basements products and services in New jersey and Philly Neighborhood place in Pennsylvania. This page contains a single entry from the blog posted on February 20, 2010 2:37 PM. The next post in this blog is Coming To Terms.